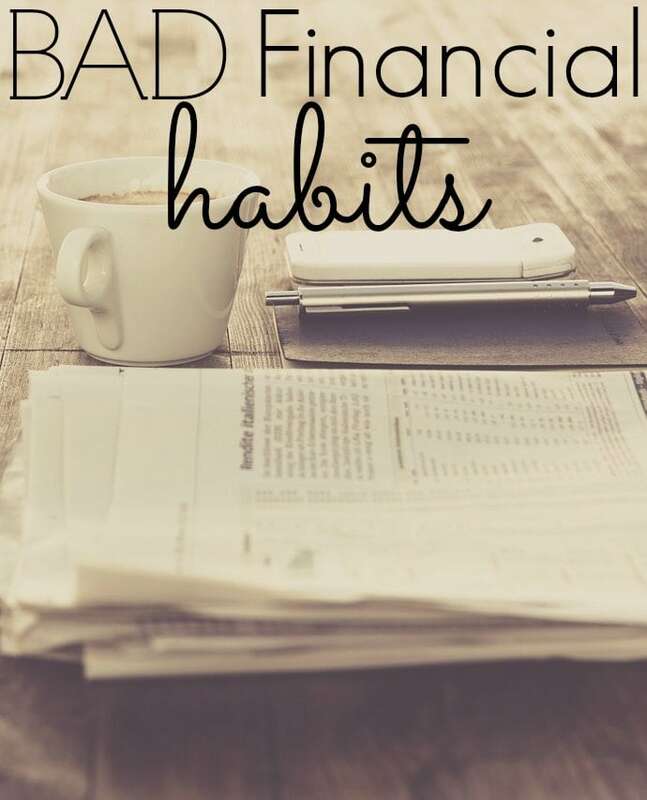 Last week, I talked about bad financial habits and how almost everyone has a weakness when it comes to personal finance. I received a lot of really great comments in Part 1. Turns out that I'm not alone. So many people don't budget correctly, don't know their true worth (this was a main topic talked about in the comments), and so on. And this is what is great about personal finance blogging, I love reading the comments and learning from others' mistakes. And hopefully people can learn from my mistakes as well. A lot of you said that you were looking forward to part 2 of this series. I'm glad everyone wants to read all about our financial mistakes. There are so many things that we probably shouldn't have done, but how else would we learn? No matter who you are, you either are currently committing bad financial habits, or you have in the past. 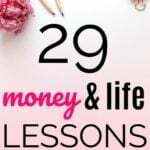 I don't know of anyone who is perfect with their finances, so no one should feel completely horrible about themselves just because they are currently committing some of these financial habits or have in the past. The important part here is that you are changing for the better! I am very guilty of this. Everyone knows this, and I probably have the label of “The Biggest Worrier in Personal Finance.” Letting money control me is a big part of my life that I do not like. I let money control me in that I think about money before I think about my health. I am working a ton of hours every week, when I should be thinking about my health and enjoying life. I also calculate our financial goals all day long it seems like. I am always afraid that we will fall behind with a financial goal, and I will let it eat me alive. 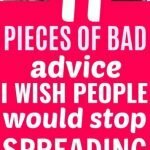 Fact is – we ARE doing good, so why do I let everything bother me so much? Don't worry, letting money control me will be a post all on it's own. I have so much to say when it comes to this! Does your employer offer some sort of benefit in return for you working for them? This could be a company match, insurance, tuition, a gym membership, discounts at places you visit, and so on. If they offer a match on a retirement account, I hope you are taking that! Maybe your employer offers cheap or free gym memberships and you've just been too lazy to sign up. W used to work for UPS, and we went a good 2 or 3 years before we really looked at all of the benefits and discounts that UPS offered. They offered 20% off cell phone service for AT&T, and we didn't know because we didn't look! Make sure to look at all of the available benefits that are offered. Do you ever catch yourself paying extra for the same service? This can be paying extra for late fees, paying extra to spread out expenses and so on. Paying late fees is almost never a good idea. Late fees can add up. If you can't remember to pay a bill, try and mark it on your calendar so that you don't forget! Paying for over-withdrawals for your bank account can add up quickly too. If you make several $1 purchases and over-withdraw from your bank account, this could then add up to hundreds of dollars in bank fees. A big one when it comes to this bad financial habit is paying extra on something such as car insurance so that you can pay monthly instead of every 6 months. 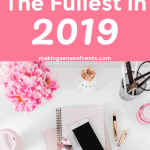 I know many people who pay some of their bills monthly so that their expenses doesn't seem as bad and they can spread it out over a certain amount of time. This can apply to car insurance especially, as most of the time you have the option to pay monthly or every 6 months. If I pay every 6 months, I usually get a 5% to 10% discount. Who doesn't want that? We used to pay monthly on many things because paying $100 per month seemed a lot less painful than paying $600 at one time. Of course, if you are unsure of the service that you will be receiving, then maybe paying in bulk isn't worthwhile. Do you bulk pay for certain expenses, or do you like to keep it on a month-to-month basis? So many people seem to not understand credit cards to the full extent. I know of many people who do not know what a credit score consists of, and I also know of many people who do not realize that making only the minimum payment on a credit card is not the wisest choice. Many think that paying only a minimum payment is actually good, and don't even know that they can pay extra. Many people think that only paying the minimum will get them out of debt quickly. NO! What other credit card myths have you heard? Do you do any of the above? Do you have anything else to add to the list? I’m guilty on the first one, letting money control me, like you, every day I check on how my finances are doing. I don’t even take lunch more often just to reach my saving goal for the week, though, I still consider myself healthy because I take heavy breakfast at home just to save on my food expenses when I go to school. You should definitely still eat lunch! Make food at home or even prep it for the whole week. 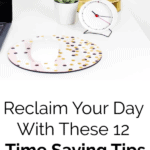 Ah these are such great tips! I go crazy when my friends don’t take advantage of the ESPP at my work, it’s a guaranteed 15% gain! It’s unbelievable. I also wish more people were aware of credit card facts so that they would stop wasting money paying the credit card company and instead be putting it towards student loans or just straight-up savings. Wow your friends definitely need to be taking advantage of that! They are crazy not to. I’m glad it’s not just me also! Thank you for stopping by. These are all great tips. Thanks Sam! I don’t have any of these specific problems but I do have a tendency to become complacent when things are going well and I’m busy. I have that problem as well! Many people are over insured. Your house insurance often has a personal liability clause, your credit card often has travel insurance etc.. but for not reading the fine print you pay extra insurance on top. This is another good tip that everyone needs to know. Thanks Pauline! The only one we’re guilty of might be the insurance and not always paying for it when it’s cheaper to do in 6 month increments. I always intend to, but never seem to get it done. A lot of people do this. Thanks for stopping by John! The benefit part is so true. I get a 15% discount for Verizon, and if I was to buy a car, we get supplier discounts on some vehicles. I also got my laptop through my employee discount. Definitely go up to HR and ask. You may be surprised, even small-to-medium sized companies have these benefits through their vendors or service providers! Yes, there are sooo many discounts! Hey Michelle! 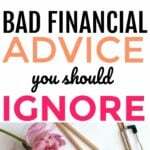 These are great tips and the show how difficult it is to take control of your finances. Many people know what they should do (save more, look for deals, invest for the future, stay out of debt) but something trips them up along the way and keeps them from doing it. I know that feeling. It is horrible! 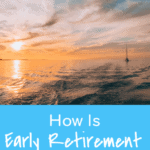 I’ve had employees who don’t sign up for their retirement plan, which has a 3% match or use a flex plan for day care expenses. I’m sure it’s just that they don’t understand it well, but I’m not sure how anyone can’t fill out a form for free money, especially on the day care because it doesn’t change your spending at all, only saves taxes. I try not to let money control me, but it’s hard not to work” just one more day” if it’s offered. It’s like people are just saying no to free money! Not exactly what you’re talking about, but I’m guilty of paying for services I could learn fairly easily on my own. I’m working on this with my car and just replaced my own battery for the first time. An oil change is next. I’ve also definitely found with things like cell phones that there are much cheaper plans available than what the default big carriers offer. It sometimes just takes a little bit of looking. Battery changes are so easy Matt! I’m glad that you are doing that yourself now. I’m definitely guilty of not paying attention to benefits offered by my employer. My employer offers discounts for cell phone service, various retailers, and even a free gym membership….but I didn’t take advantage of anything until at least a year into my employment. Looking back, I could’ve saved so much in that year! This is exactly how we feel! The insurance one and the over withdrawal fees apply to me the most. I really need to work on the fees. I use mint and it keeps that of how much I’ve spent on fees over my time on the site. It’s at about 1200 over the course of 4 years. It makes me sick. That’s $300/year in fees that I shouldn’t be paying. I know many people who don’t take advantage of benefits at work…I try to max them out! Flex spending for healthcare…big savings. Pre-tax commuter savings. 401K, etc. No reason not to participate. Yes, definitely max them out! I am very guilty of these from employer’s benefits, to late fees to credit card payments. I found myself paying for gym and I was not taking advantage of the reimbursement our employer was offering. But I have decided to change for the better. I am totally guilty of letting money control me at times. I do the same things you mentioned like constantly looking at our finances and goals to make sure we’re on the right track. Sometimes I wish I could just turn that part of my brain off and just look at everything once every few weeks. Also, I have a co worker who thought he needed to only pay the minimum in order to have a good credit score. Talk about dumb. I hope there aren’t too many people out there like this, but I think there may be more than I would like to know about. Yes I wish I could turn it off also! Of all the bad habits you’ve mentioned in parts 1 and 2, this one is by far the biggest one for me. I constantly obsess over our financial goals and choices. I may not take the time to re-analyze or reevaluate every day (although oftentimes I do get sidetracked doing so and waste an hour or two), but the thoughts to do so always pop into my mind. It’s difficult to avoid though since money/finance impacts just about everything in life (from how much you’re spending at the grocery store to how much is coming out of your paycheck for retirement savings or health insurance). I fear I won’t be ever be able to not get carried away about this stuff until I realize we are 100% financially secure (which is a long time away!). Letting money control you definitely seems to be a common response today. Glad I’m not alone! I definitely need to learn how to take advantage of credit card rewards a little better. I know I am leaving money on the table there. When I first got my credit cards I had the minimum payment mindset. I knew I could easily afford the minimum payments so I maxed out all of my credit cards. Credit card debt is awful! So many people think this way! I let money control me as well. I save out of fear, and it’s mostly from watching my parents struggle through the years. No matter how much I have in savings, I always want more. There has to be a point where it’s enough, otherwise I’m never going to let myself have any fun! It’s incredibly difficult to get over this mental block, but I am very slowly coming around to being okay with going out from time to time or treating myself. I know exactly how you feel! Always wanting more is a big problem of mine. I am incredibly guilty of letting money control me. I constantly check our online banking accounts. I reconcile the checkbook every single day. I worry about overdrawing our accounts. I worry, worry, worry. It can quickly get out of control and become all-consuming. I have to step back, take a big breath, and let go. Yes I am always checking also. It drives me nuts! I used to be so bad when I had a cc payment of forgetting to pay and getting late fees..also when I used to rent movies from blockbuster. I try to mark things on my calendar now so I don’t forget. I would also add knowing what your minimum balance is to avoid “service fees” for banks. God I hate seeing that money go to waste! Good article! I am horrible when it comes to returning movies. So now I just try to not rent them at all. Like you, I worry about money too much. Need to start learning how to let go a tiny bit more. But if I let go we end spending more and going over budget! How do we live more carelessly and not spend more? That is something I’m trying to figure out. My biggest financial sin is probably that I don’t check regularly the benefits my employer provides; I mean that ‘extras’ like discount on motorbikes and such (no joke; I can get a scooter much cheaper in an attempt to get people out of their cars). As to control, the only advise my mum gave me when I went to university was: ‘Learn to control money or it will control you.’. Took my time to understand what she meant but got there in the end. I definitely need to stop letting money control me. Thanks for stopping by Maria! I’m guilty of not making full use of employer-matched contributions for stock options and retirement contributions. I am still contributing though, so that’s something. Eventually, I will up my contributions to the maximum amount allowed for matched contributions, but was holding back as I wanted to save as much cash as possible. Thanks for sharing part 2! Paying more for the same services is a bad habit I have. Too often laziness will get the best of me and I’ll end up paying more instead of shopping around. Yup, laziness gets me all the time also. Can you bring the “chill” factor up or down a notch? (I’m not sure which way you need to go with that) Seriously – I don’t mean to be a wet blanket here, but that may well be what you need. I am all in favor of you guys busting your butts while you’re young and can do it – to get debt the hell out of your lives, but you’re beginning to worry me. Breathe deeply and trust – trust in yourselves, God, karma – whatever. But, please slow down a tad. You’re all going to be just fine. You’re living in America for God’s sake. THESE ARE THE TIMES OF YOUR LIVES! Chill out – at least a tad. Otherwise you’re going to so ingrain this course of behavior in yourselves that you’re going to stroke yourselves out at 70 years old – when you should be enjoying all the fruits of your labor. I totally agree with you Michelle. We should not be controlled by money instead we should be controlling it. I am guilty of so many of these! Mainly letting money control me. It’s either controlling me and I’m worrying about it 24/7 or I’m in denial and choose not to know how badly we’re doing. Example, until earlier today I had been playing the denial card which led to something you mentioned: Paying extra for the same service. I think I’ve built up over $50 in late fees this month between my business and personal account. Not ok.
Noooo! It seems like a lot of people have this problem. I am thinking if I am actually doing habit number one, because yes I work A LOT every week, and for this reason I don’t get to spend time with my friends that often anymore. However, it’s not really because of money that I do that. I just love and enjoy so much what I am doing. I work in non profit where there is rarely matching to 403(b)s (if they even offer a 403(b)!). So when I talk to friends about their benefits at their corporate job and they mention they get matching but don’t use it, i just don’t get it! It’s free money people, take advantage. Also, the discounts on phones is one that many people don’t realize. If you work for a major company or the public service, there is a good chance you get a discount on your cell phone service. My mom is a Ford retiree so my brother and I each pay for ourselves and split my mom’s payment because the 20% discount we get for Verizon is too good to pass up! My fiancee’s dad works for the state of PA and I mentioned he might get a discount. It turns out he does and is saving a 20% on his AT&T plan. Yeah so many places offer phone discounts. We still get to use ours and it’s been over a year! Here’s our BIGGEST budget mistake. Does this ever happen to you: You’re thinking about putting an extra $50, $100, or $200 to a specific debt but you’re hesitant to in case something happens and you need it. You come home on a Friday night after a rough work week and don’t feel like cooking and without thinking TWICE, you go out to eat and spend $100 before you can blink?! That’s us, in a nutshell. We’ve needed new exhaust fans in our bathrooms for.. a year and a half now and haven’t invested the $100ish in them..yet we go out to eat and blow that without thinking. ::sigh:: We’ll get there. Blogging has helped hold us accountable! You just worded this perfectly! We ALWAYS do this. I am so guilty of letting money control me. I work more than I should, and when I’m not working, I’m worrying. I know it doesn’t get me anywhere, but its so hard to stop!